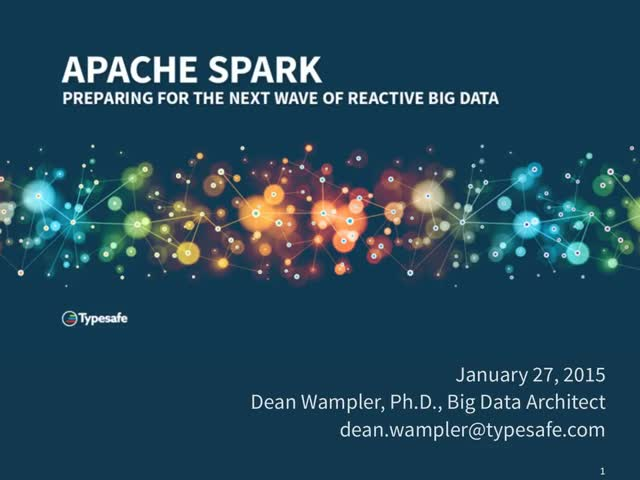 In this video resident Big Data expert, Dean Wampler, will present the surveys findings and discuss why JVM devs should care even a little about Big Data tooling in 2015. Dean Wampler, PhD, Big Data Architect, Typesafe, Inc.
Christopher Hunt, Senior Engineer, Typesafe, Inc.
As Reactive application development goes mainstream, Operations has become painfully aware that the demands of Reactive applications are simply not met by yesterday’s software architectures and technologies. Typesafe is proud to announce the upcoming release of ConductR, a management tool for Operations to conveniently deploy and control Reactive, microservice-based applications running in a cluster. Jamie Allen, Sr. Director, Global Services, Typesafe, Inc.
Duncan DeVore, Senior Consultant, Typesafe, Inc.
Akka, a toolkit and runtime for building highly concurrent, distributed, and fault tolerant systems, has been a game changer for Java devs. Akka decouples business logic from low-level mechanisms such as threads, locks and non-blocking I/O, and liberates devs from the hariest challenges of managing the state and location of services. 1. Why do I need to think “distributed” now? Are you ready to move your application from prototype into production? From architecture and security concerns to operational hurdles, the complexity of an enterprise-scale production deployment can increase rapidly. Join us for a webinar with Jamie Allen, Director of Global Services, to learn more about how you can ensure a successful production deployment of your app. Typesafe (Twitter: @Typesafe) is dedicated to helping developers build Reactive applications on the JVM. With the Typesafe Reactive Platform, you can create modern, message-driven applications that scale on multicore and cloud computing architectures. Typesafe Activator, a browser-based tool with reusable templates, makes it easy to get started with Play Framework, Akka and Scala. Backed by Greylock Partners, Shasta Ventures, Bain Capital Ventures and Juniper Networks, Typesafe is headquartered in San Francisco with offices in Switzerland and Sweden. Presented by: Dean Wampler, PhD, Big Data Architect, Typesafe, Inc.